Buy 10 Books and Get free shipping! Financial professionals all agree that they need new clients. But the challenges of running a practice with a healthy client base and mounting admin crowds out the time for a dedicated prospecting effort. The result? A prospect-when-I-get-to-it approach that sounds transactional to prospects. Without a dedicated prospecting effort, advisors, planners bankers and insurance pros face real revenue gaps in their practice. In order to respond, this book provides a proven system that will get you the growth you need that positions you as credible, not salesy. In Taming the Four-Headed Dragon, author Bill Walton helps financial professionals in wealth management, insurance and banking better manage the time that competes with effective lead generation and nurturing. Second, he provides a system that's intuitive, admin light and aspirational based on your ideal client base. Readers will learn where to find ideal prospects, the conversations starters to get off on the right foot, and advancing strategies to get prospects comfortable to change. Readers are also provided the famous Relationship Review closing meeting agenda that gets prospects to decide in the moment. If you are a financial professional who is struggling to balance all that it entails to run, market, and grow your practice, then Taming the Four-Headed Dragon is the book for you. This “phenomenal” book, as one reviewer called it, is packed with proven tactics and strategies to help financial professionals get clear on who's an ideal prospect and arm their COIs with relevant messaging to make the right introductions. Nationally recognized client acquisition specialist Bill Walton provides a prospecting system that turns every conversation into a beneficial next step toward closing business. conduct meetings that compel prospects to act. Bill Walton’s sales training programs have been adopted by Wall Street’s top firms, high-profile banks and world renown insurance companies. Drawing on his years of experience of coaching high net worth individuals, Walton has provided an essential guide for growing a client base on a limited time budget. "As a seasoned financial planning professional I recognize the necessity of having a professional coach. When I learned industry professional Bill Walton was writing a book I had to read it. Taming the Four-Headed Dragon is a must-read if you are serious about being a "Master" in your profession. 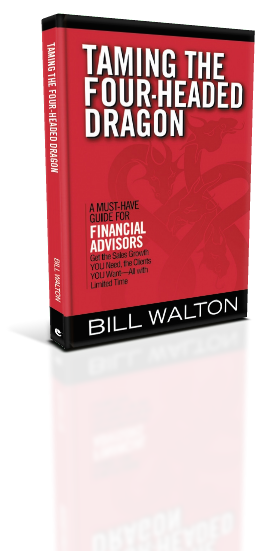 Bill’s book provides immediate strategies for financial advisors to increase their income. Read it, implement the strategies and see your production increase!" "With Taming the Four Headed-Dragon, Walton has crafted a practical blend of psychology, strategy and tactics that work! Walton masterfully outlines the “what and how” of selling in the 21st century as an FA while incorporating the “why” from the perspective of both advisor and client. Unlike other books that end up on a shelf, expect your copy of Dragon to be underlined, highlighted and referred to daily. You may even want to pick up a spare copy." "As Bill shares, in our rapid-paced environment, the most successful financial advisors have become incredibly disciplined in their processes and activities through focus and execution of a well-crafted plan." "Taming the Four-Headed Dragon is filled with clear, actionable steps to bring focus and clarity to drive more effective interactions with clients and prospects, Taming the Four Headed Dragon will help improve your practice." "Amid the clutter of "List Books" -- 4 ways to improve your sales, 9 steps to this or that -- comes this gem. Logical, profound, and intense, this is the guide for already good advisors who need to become great." Copyright © 2018 ProDirect LLC. All rights reserved.